Locomotive 151 greets visitors as they approach the Museum of Industry. It actually appears to be emerging from the side of the building, but it is no runaway train. Built for Dominion Steel, Sydney Steel Division. 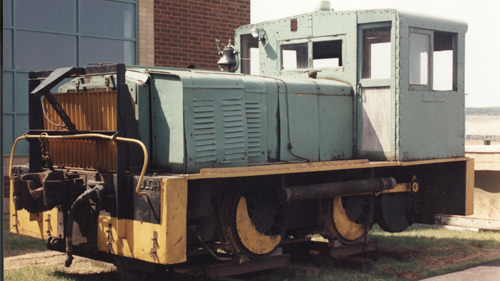 Small industrial locomotive used at the industrial yard, Nova Scotia Steel & Coal Co (later Dominion Steel & Coal)., Trenton Works, Trenton. Made by the Baldwin Locomotive Works, Philadelphia, 1917. Please note the following locomotives are not on public display. 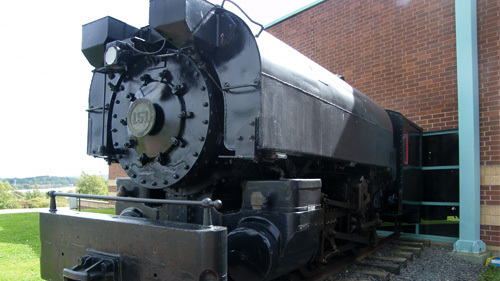 Locomotive 42 is a sentimental favourite of many people in Pictou County and Cape Breton. Built at the Schenectady Locomotive Works in 1899, it was acquired by Dominion Coal in 1901, then carrying the number 16 as a 2-6-4T. It seems to have been built as a tank locomotive and later converted to a tender locomotive. 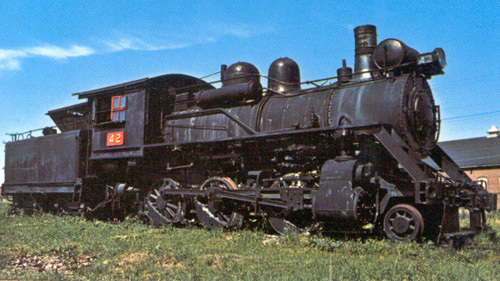 It became Locomotive number 42 in 1952 and ran on the Sydney and Louisburg Railway until 1955 when it came to Stellarton to work for Acadia Coal. In 1963 it was collected by a local railway enthusiast and it was featured in a commercial for a local paint company, adding to its fame. 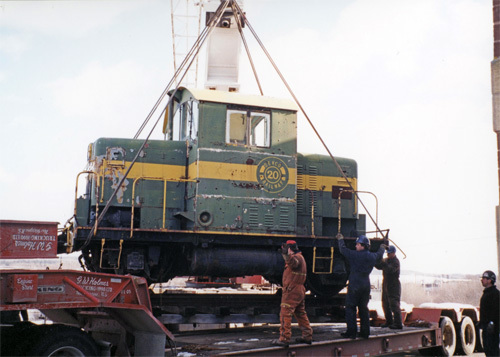 From 1973 to 1979 Locomotive 42 ran on the Cape Breton Steam Railway, a tourist line between Glace Bay and Louisbourg. 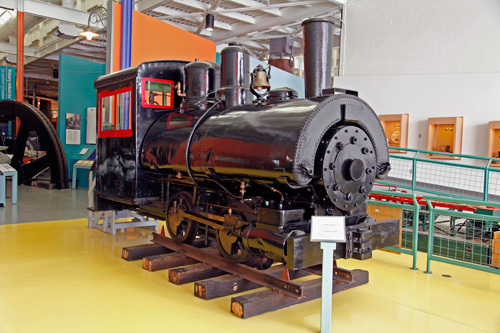 It was later leased it to the Salem and Hillsborough Railway Museum until 1983 when it was donated to the Nova Scotia Museum. Last used: Acadia Coal Co. Ltd., Stellarton, 1963. Links: Sydney & Louisburg Railway Historical Society official site. Built by Canadian Locomotive Co., Kingston Ont., in 1906, Locomotive 7260 began its career with the Intercolonial Railway. It was later with the CNR and then finished its working life with Intercolonial Coal. Last used by Drummond Coal Co., Westville, 1964. Plymouth This gasoline powered industrial locomotive from Wallace Quarries Ltd. Manufactured in Plymouth, Ohio by Fate-Root-Heath Co., 1943. Worked in Alberta, New Brunswick (used to build part of Cape Tormentine ferry terminal) and then at Wallace Quarries, Nova Scotia. Vulcan Diesel locomotive built in 1928 and delivered to Mersey Paper (later Bowater-Mersey), Liverpool, NS. Vulcan was there when the Mersey Paper Mill was officially opened Dec. 14, 1929 and operated there until it was given to the Museum of Industry in 1991. The original gasoline engine was replaced in 1958 by a Rolls Royce diesel engine with a torque converter. DEVCO 20 This diesel locomotive shunter was purchased by the Cape Breton Development Corporation (DEVCO) in 1969. Built in 1940 by General Motors, it is one of the oldest surviving diesels in Canada. A General Motors controlled company, Electro-Motive Co., had been making diesel locomotives since the 1920s, the experimental era of the technology. The transition from steam to diesel-powered locomotives on Canada’s rails happened gradually starting in the 1940s. In 1948 there were 4,340 steam locomotives and only 148 diesel. By 1957 almost half of the steamers were gone while diesels were up to 2,300. 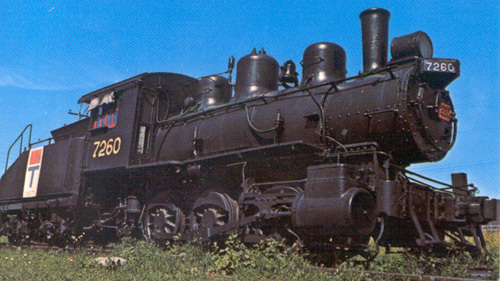 By 1963 both CN and CP considered themselves completely dieselized. Manufacturer: Electro-Motive Co. (Division of General Motors) LaGrange, Ill.